Edgar Martinez’s No. 11 will hang alongside the No. 24 of Ken Griffey Jr. as the only two retired numbers in Mariners history. The celebration will be Aug. 12. 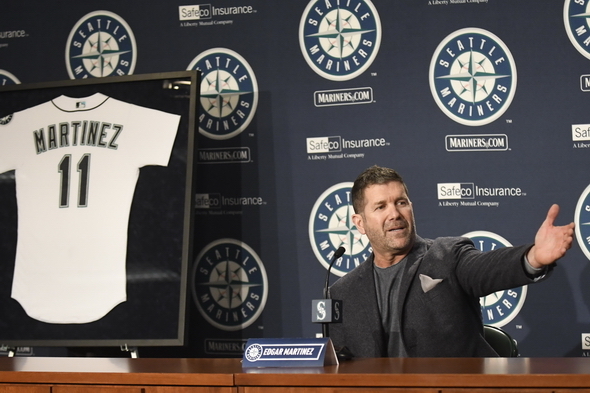 The Mariners will retire Edgar Martinez’s No. 11 during an Aug. 12 ceremony at Safeco Field and hang his jersey next to Ken Griffey Jr.’s No. 24 on the ballpark’s center-field facade. Martinez spent his 18-year major league career (1987-04) with Seattle and is currently the team’s batting coach. The club announced the move Tuesday afternoon. The Mariners retired Griffey’s No. 24 in July, shortly after he was inducted into the Baseball Hall of Fame with a record 99.7 percent of the vote. Martinez, 54, received 58.6 percent of the Hall of Fame vote in early January and has two years remaining to achieve the necessary 75 percent. They are the only players in franchise history to have numbers retired. “Edgar Martinez is the string that binds together our franchise history,” Mather added. “As we embark on our 40th anniversary season in 2017, Edgar has been in a Mariners major league uniform for 20 of those seasons, all proudly wearing No. 11, and has been a part of our organization for 36 years. “He has worn a Seattle uniform in parts of four decades, and today’s announcement will assure that his number will be proudly displayed in Safeco Field forever. Martinez, who signed with Seattle as a non-drafted free agent in 1982, finished with a lifetime .312 batting average, .418 on-base percentage and a .515 slugging percentage (.933 OPS). Edgar was inducted into the Mariners Hall of Fame June 2, 2007. He also won five Silver Sluggers and is the franchise’s all-time leader in doubles, runs, RBIs, walks, extra-base hits and games played. Martinez delivered several of the biggest hits in Mariners postseason history, including the iconic double that scored Griffe with the winning run in Game 5 in the 1995 ALDS to defeat the New York Yankees. He also became the first player in postseason annals to drive in seven runs in a single game in Game 4 of the ’95 series, hitting a three-run home run and a grand slam as the Mariners erased a 5-0 deficit to stave off elimination. In Game 4 of the 2001 ALDS at Cleveland, Martinez drilled a two-out, two-run homer in the ninth inning (another elimination game) to break open a 4-2 contest. Martinez also won the Roberto Clemente Award (MLB’s top humanitarian award) and the City of Seattle renamed a section of South Atlantic Street (which runs alongside the ballpark) Edgar Martinez Drive in 2004. He was inducted into the World Sports Humanitarian Hall of Fame in 2007. The 2017 season will mark Martinez’s third as the Mariners’ hitting coach. He was hired June 20, 2015.